Follow box directions with the added and replaced ingredients. For parchment cupcake papers cut 3 1/4” squares and squish down into cupcake pan. Mix all the ingredients until smooth. Use a round piping tip to pipe the icing. Zest an additional orange for to garnish and sprinkle a little sugar on top. I'm going to make these for my mum for mothers day. Seems soo simple! And mini cupcakes are way cute. just saw you over at design*sponge. i had to stop and tell you ... first.. congrats on the baby. second... these cupcakes (and flags) are so FREAKIN' cute! I can't stand it! thanks for sharing! soo inspired... i will be making these next week for my open house!! did you use a special kind of cutter to make such perfect circles? I would love to know how you made the cupcake liners. What is the font that's used for "No." and the date. This sounds delicious. Can't wait to try it! What a perfect recipe! I can't wait to make them! Omg, I think I must make this, although where do you find grape seed oil and is that essential?? was directed to this recipe through desgin*sponge. i absolutely love orange chocolate (the ones they sell during christmas) and this is a real cute way to tel your co-workers the big news. congrats and thanks for sharing! I wish packaged cake mix wasn't used.. Cute though! Agree love the presentation and want to learn which fonts were used. Made these last night for my birthday, but we used our own chocolate cake mix from scratch! They turned out well, though I might try making a devil's food cake next time - or simply using more chocolate - since the basic chocolate cake recipe came out lighter than expected. The ones in the photo look *really* dark! The orange juice AND orange zest made our icing very strong, but perhaps that's because the cake was so light. A neat twist for the over-21 crowd might be to substitute a splash of Grand Marnier for the OJ in the icing. ;) Fantastic recipe, thanks for sharing! Made these today and they were a hit. Thank you! I'm wondering why it is called Orange chocolate cupcake. 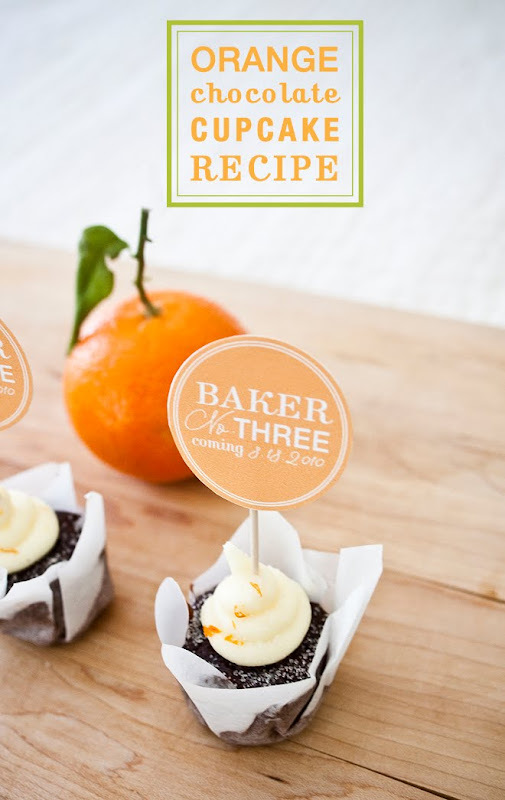 Is it because of the orange presented in the layout or does the cupcake have a mix of orange flavor? Hehe. Well anyways, the presentation will make you crave for it and the icing is perfectly placed. Cheers!